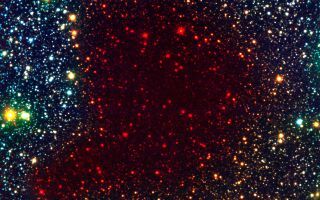 This view of the dark cloud B68, a so-called Bok globule, is a false-colour composite based on a visible (here rendered as blue), a near-infrared (green) and an infrared (red) image. This spectacular space wallpaper reveals a view of the dark cloud B68, a so-called Bok globule, which is a false-colour composite based on a visible (here rendered as blue), a near-infrared (green) and an infrared (red) image. Since the light from stars behind the cloud is only visible at the longest (infrared) wavelengths, they appear red.